As usual, Brandon Southall is posting regularly from sea as his research team begins the third year of a five year Behavioral Response Study off the coast of southern California. The field work is largely focused on conducting controlled exposure experiments (CEE) on a fairly wide variety of species, in order to learn more about how each species responds to various types of sounds. Animals are approached in zodiacs in order to attach Dtags (temporary suction-cup tags that record sounds heard and produced by the animal, as well as detailed three-dimensional dive patterns) or one of several other types of tags; once the tag has been on long enough for the animal to relax after that tagging approach, a larger ship maneuvers in to position and transmits sequence of test sounds. So far, test sounds have been a simulated mid-frequency active sonar signal (peaking at 25dB quieter than the Navy uses) and a pseudo-random noise stimulus. For background on this year’s study objectives, see the SOCAL-12 informational webpage. Maritime traffic and geophysical exploration –including the search for hydrocarbons– “drastically” reduces the song effectiveness –linked to reproduction and which propagates hundreds of kilometres beneath the Sea– of the whales, which are also the group of marine mammals with the greatest acoustic sensitivity at low frequencies. “The noise generated through human activity in the oceans leads to possible chronic effects on the health of this species”, Castellote states. After analysing 20,547 hours of recordings of the sounds emitted by the whales, the study published in Biological Conservation indicated that the whales modified the characteristics of their songs in order to try to reduce the impact of noise on their propagation. In addition the researchers recorded a massive displacement of fin whales, triggered by the noise from geophysical prospecting at a distance of 285 km from the study area. “These recurrent displacements, together with the changes in acoustic behaviour, could increase the energy expenditure and reduce the reproductive success of whales affected by the noise”, the expert indicated. The town of Falmouth, Massachusetts has been the site of some unusually wide-ranging efforts to come to grips with the unexpected impacts on nearby neighbors after two town-owned turbines began operating at the local wastewater treatment plant. Several dozen neighbors, most living within a half mile or so, have spoken out consistently about their experiences with turbine noise, leading to an evenly split town meeting last spring in which about half the town meeting voters asked that the turbines be shut down, and half urged the selectmen to pursue a collaborative process to come up with a solution to the problems. In response, a committee was formed to come up with a set of options to offer to the selectmen, hopefully in time for the fall town meeting, though it may take longer. The process is being facilitated by the Consensus-Building Institute, which has created a website where you can track the progress of the committee. Here you can find generalized meeting minutes (usually available within three weeks after each meeting; look for items called “Final Meeting Summary” under each date), presentations made at meetings, and some outside documents, including the full collection of testimony from over forty residents submitted to the Falmouth Board of Health when it held a hearing on the issue. In addition, local public access TV is making videos of all meetings available; links to these videos appear on the CBI page as well. 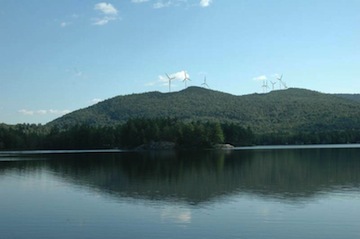 A permanent sound monitor installed 2000 feet from the Spruce Mountain Wind (SMW) property line between the last turbines and Shagg Pond had its wires chewed by mice, so has not been collecting data recently. While SMW had earlier applied to the state DEP to discontinue routine monitoring, and instead respond only to specific complaints, that application was recently withdrawn. Earlier monitoring data, as well as spot checks after two complaints (one in February and one in July) showed that the project was operating within its permit conditions of 55dB in the daytime and 45dB at night. Ed. note: once again, we may be looking at an example of a high permitted level leading to intrusive noise conditions (well above other sounds) even when in compliance; in addition, if there are compounding factors that cause higher sound levels in conditions hard to identify or replicate (e.g., unusually high degree of inflow turbulence), a short spot check may not catch the same noise conditions, even if winds are from the same direction and speed. The Woodstock committee charged with drafting a town ordinance to govern future wind farm construction had been considering a 1-mile setback as one possibility. Given the recent complaints, committee chairman Bob Elliott said they may need to consider larger setbacks, lower noise limits, or both. In addition, they are considering a requirement that project developers fund an escrow account to allow the town to hire its own consultants as needed. In one recent case a couple saw the value of their home 650 yards from the Fullabrook wind farm near Braunton, Devon, fall from £400,000 to £300,000 according to a local agent’s estimate. The couple, who were not attempting to sell their house, told the VOA that the persistent whooshing noise caused by the turbines and the visual intrusion – including a flickering shadow when the sun is directly behind the blades – made their property less valuable. The VOA accepted their argument and agreed to move the property from council tax band F to band E, amounting to a saving of about £400 a year, the Sunday Times reported (subscription required). The Sunday Times story goes on to note that the VOA has received other applications for property value reductions near wind farms, though the number is unclear because only those reaching appeal are made public. At least three other properties have had reductions approved, though factors other than sound alone reportedly came into play. At least one successful appeal, by Jane Davis, came after real estate agents refused to even list the property she had moved away from because of wind farm noise. Health Canada, the country’s health department, is preparing to launch a study of health effects among residents near wind farms. The study as currently planned will be based on interviews and physiological measurements of 2000 people living near wind farms of 8-12 turbines. Each participant will fill out a self-reported health survey, and will be tested for stress hormones, blood pressure, and sleep patterns. Study subjects will live from under 500 meters from turbines to over 5km. This is somewhat old news, but a recent article brought it to my attention. The Michigan Public Service Commission’s Wind Working Group, an advisory committee, appointed a Wind and Health Technical Work Group in 2010 to look at siting standards; they were charged with making recommendations regarding physical safety and noise limits. Dr. Jerry Punch, an audiologist and professor emeritus at Michigan State University, was chosen to chair the panel. Kenneth Rosenman a professor of epidemiology (occupational diseases) at MSU was co-chair. Soon, Clevey was presenting the work of the Wind and Health group under his name; this March 2011 presentation is the final mention of the project in the records of the Wind Working Group, which has met three times since then. In that presentation, Cleavy stressed the role of community engagement to alleviate concerns, and posited that there is insufficient evidence to spur any changes in current noise standards, which stand at 55dB. However, Punch, Rosenman, and one other member of the Technical Working Group released their own report, summarizing what had been the emerging recommendation of their group before it was disbanded. The key recommended change in Michigan standards is that noise from wind turbines should be limited to 40db at night, as measured outside homes. It’s not entirely clear if they’re recommending a 40dB annual average, or a 40dB average over a number of 10-minute periods. Their recommendations also include the option for wind developers to obtain waivers from homeowners, to allow sound levels higher than 40dB; but they recommend an absolute maximum of 55db, which is the current state noise limit for wind farms. A trio of towns in southeastern Massachusetts continue to address turbine noise issues in response to neighbor complaints about sleep disruption and health effects near small wind farms of three to four turbines each. In Falmouth, which was the first of the towns to have turbines begin operating close to homes, the affected neighbors have joined a committee charged with coming up with a set of options to present to the Selectmen, hopefully in time for the November town meeting. Across the bay in Fairhaven, where even more people live within a half mile or so of turbines that began operating this spring, the Board of Health has received over a hundred complaints, and asked the developer to submit a plan for how he might be able to reduce noise and flicker issues; the first response, received this week, was more focused on doubting the veracity of the complaints. Sumul Shah, the developer, stressed that nearly two-thirds of the 132 complaints had come from either plaintiffs in the lawsuit against the town seeking to dismantle the turbines or others who had publicly voiced their opposition to the turbines before they were operational, suggesting that since some others seem to tolerate the noise, those complaining should be able to also. Ed. note: Indeed, many nearby neighbors objected to the turbines as they were being permitted, based on the problems that had cropped up in nearby Falmouth. The fact that some of these same people are now experiencing noise issues should not come as much of a surprise to anyone; about fifty of the complaints have come from people not involved in either effort to stop the turbines. Board of Health member Barbara Acksen said she was appalled by Shah’s letter, saying “We were not at all pleased with the report. He should just be responding to the data and not casting aspersions on people who complain,” she said. “You can’t just say ‘Well, these people didn’t like the turbines before so their complaints don’t matter. '” Shah says that he can’t consider mitigation options until it’s determined whether the turbines are out of compliance with state or local noise statutes; the state DEP will begin noise tests sometime in the coming month. it appears that this may become another in a series of projects in which a wind farm may operate largely or totally within its permitted noise criteria, while still causing widespread noise issues for neighbors. This situations suggest that many noise standards may not be sufficient in communities used to peace and quiet, yet home to a moderate density of homes. I live 2/3rds of a mile away from them. Not a day doesn’t go by I don’t hear them. Not 1. I say again 2/3rds of a mile away! How loud do they need to be for them to be heard at that distance – constantly? Most nights the noise isn’t loud enough to keep me awake. Sometimes it is. So it is my experience that the people who live much closer have a very very legitimate complaint. I can’t imagine living closer to them.